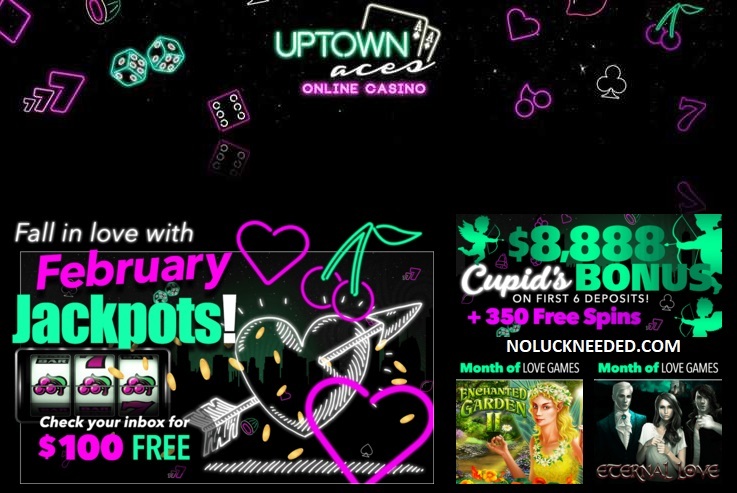 Celebrate the month of love and play the best online slots at Uptown Aces Casino and Uptown Pokies with the February Jackpots bonus pack. Redeem the coupon codes SLOTSLOVE-1 and SLOTSLOVE-2 to claim your 150% and 200% bonuses and then claim your $100 free chip reward with the coupon code FREE100LOVE and win up to $500. Good Luck! Free Spins Game: varies monthly; $25 minimum deposit. 30x wagering. No Maximum cashout! Available ONCE a Week from Tuesday to Saturday. Claim Your Febraury 2019 Bonus Codes and Free Chips at Uptown Aces Casino!